Finding innovative and space-saving ways to store equipment within the school environment can be a challenge; making the storage fun and safe at the same time requires a creative approach. Brazilian POS design and production company Artwork Digital was given just that task by the Bau Econhecimento School. 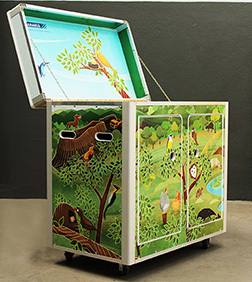 The school wanted low-cost, mobile storage boxes for books, films, costumes, puppets and props used in students’ ecology and environment lessons. Light and easy to move around, the boxes had to be safe to handle while being colourful and appealing to the students. With a consideration for the environment, they also had to be produced using 100% recycled and recyclable substrates. Seven boxes were produced. Made from 16mm re-board, each box comprised two doors, two drawers, shelf and lid, mounted on casters. The individual box parts were digitally printed on Artwork Digital’s Inca Onset S20 flatbed printer using non-solvent UV inks, before being cut and assembled.